Check out any fastpitch softball flyer or website offering instructional materials and you will find tons of books and DVDs focused on drills, drills, DRILLS! It almost seems like an arms race sometimes to see who knows the most drills. Don’t get me wrong – drills can be very helpful. But like anything else they need to be used strategically. Drills are only valuable when they answer an actual need (other than keeping some players occupied while you work with others). Here’s what I mean. Take a hitting drill that focuses on extension after contact. Seems like a worthwhile way to spend your time. But if the player already has good extension after contact, it can actually be wasting time that would be better spent on another aspect that isn’t as strong. The same goes for pitching drills focused on the arm circle. While it can always be a little better, players only have so much time to practice. That circle drill might have already hit the point of diminishing returns, where time spent increases sharply while actual gains don’t rise much at all. The other issue with doing drills for the sake of drills is that softball skills typically require multiple combinations of movements, whereas drills are designed to isolate movements. As such, drills are great for working on isolated issues. Sooner or later, however, those individual pieces need to be rolled back into the full skill. Spend too much time on the drills and you won’t have enough time to develop the actual skill that’s required. Sort of like spending the bulk of your time cleaning your boat instead of taking it out on the water. Once the player has learned the basics, my recommendation is to spend as much time as possible practicing the full skill, end-to-end, and then use drills to address problems you’ve identified within them. As opposed to just running through a set of drills because you saw them on the DVD. It will be a much more efficient use of time, and will help you turn out more game-ready players. It’s that time of year again. The time when we all get a little reflective and start thinking about how we can become better versions of ourselves in the coming year. Perhaps we’re thinking it’s time to get serious about losing weight, which is always a popular theme. As a meme going around Facebook right now says, I’ve started on my plan by getting rid of all the bad-for-you food in my house, and it was delicious. Or it could be to stop smoking or some other unhealthy habit, or to exercise more, get a new job or clean the house once a week instead of letting everything pile up until family is coming over. There are lots of things you can resolve. Resolve to learn something new. Take a skill you’re sure you already have down and seek out new information about it. Or look for things you weren’t aware of before. If you’re a coach, learn new offensive or defensive strategies.You’re either moving forward or falling behind. Get out there and learn. Resolve to stay more in the present. The current buzzword for this is “mindfulness.” Google is offering classes on it on its campus, and other schools are teaching it as well. It’s a form of meditation that helps you block out distractions and worries so you can focus on the present, reduce stress and keep control of your feelings. In softball, you can only hit, pitch, throw, catch, etc. one ball at a time. Play the game one pitch at a time and it becomes far easier. This book can help you learn to do it more effectively. Resolve to enjoy the game more. Most people get involved in fastpitch softball because they love to compete. But sometimes in the desire to compete we forget that at the end of the day it’s a game, and games are supposed to be fun. (I know I definitely fall into this category.) Remind yourself from time to time to just enjoy the beautiful day, and the opportunity to spend time with so many great people. Smile more, especially in tense situations, and be glad your biggest worry at the moment is whether you’ll get on base instead of whether you’ll be able to find food or clean water. The days, weekends and even the seasons may seem long, but believe me the career is short. Resolve to put people first. If you’re a player, try to help those players who may be struggling. We’re not all given the same athletic gifts, or the same opportunities to learn, so it may seem like some players are dragging the team down due to lack of ability. If that’s the case, and they’re willing to get better, help them out instead of complaining. If you’re a coach, remember that kids don’t sign up to play ball so they can get a closer seat. They sign up to play. Be willing to sacrifice a few Ws to ensure all your players have a great experience. Besides, you never know who might develop. Pro sports are filled with undrafted players who outshine the top prospects once someone lets them on the field. Resolve to follow the rules – even if you don’t like them. This is part of respecting the game. If you are a pitcher who leaps (or coach one who does), work on stopping it. Don’t block the baseline (obstruction) just because you think the umpire won’t call it. Don’t throw a hard tag on a baserunner with the intent to injure them because you don’t think you’ll get caught. Know the rules and follow them. They’re there to make the game safe and fair for everyone. Resolve to respect the umpires. Again, you may not always agree with them, but it is a tough job. There will always be a few bad apples, but 99% of umpires are doing the best they can, and are out there game after game because they love the sport. Here’s another hint: just about every umpire could care less about the outcome of the game, i.e., who wins. So they’re not making calls to screw you over, no matter what you may think. Resolve to practice better. Notice I didn’t say “more.” That may be a part of it. But practicing better means being focused and productive for whatever time you dedicate to it. As a player, instead of just knocking balls off a tee to fulfill a time requirement, use that time to improve your swing. If you’re a catcher, use the time you’re spending catching for the team’s pitchers as an opportunity to work on your framing, blocking and other skills too. Be present, know what you’re working on and why. If you’re a coach, work to increase the number of touches each player gets while eliminating downtime or standing around time for each. Small groups doing multiple things often work better than one big group doing the same thing. Resolve to say “thank you.” Those may be the two most powerful words in the English language. Players, thank your coaches after a practice session, game or tournament. Coaches, thank your players and parents for their dedication, help, support, etc. Everyone thank the umpires. If a tournament director does a great job, thank him/her and the staff, and let others know what a great tournament they ran. Resolve to take better care of your equipment. Clean helmets, bats and catcher’s gear. Throw a little conditioner on gloves/mitts, and keep a ball in them. Avoid throwing your equipment when you get angry. Take care of your equipment and it will take care of you. Those are some good starting points. What did I miss? What are you resolving to do for 2016? And oh, have a Happy New Year! That’s fine as an early teaching tool, or for outfielders who need a big arm circle to throw far. But for many positions that same motion is a time waster. Once players get their basic throwing motions down, it is important to start making adjustments based on position. As a rule of thumb, the closer a player starts to home, the shorter the arm circle should be. Clearly, catchers will have (and need) the shortest arm circles. The most they have to throw is 84 feet, 10.25 inches (home to second), and when they do it they usually have about 2 seconds or less to make that throw. Dropping the thumb to the thigh takes up way too much of those 2 seconds. Instead, they should bring the almost (but not quite) straight back, making a very small arm circle that dips down and then comes up quickly before throwing – all in one continuous motion. That last part is very important, as any hesitation at all gives the runner more time to get to the base. Infielders will likely have a little larger circle, although part of that depends on whether they are moving toward or away from the base they’re throwing to. A shortstop going into the hole, for example, will need a larger arm circle to make the long throw. The same shortstop moving in and to her left will make a quick release. Third or first basement fielding a bunt will also have a minimal arm circle, trading that extra power for a faster release. Generally they’re a little stronger and can put some zip on the ball without too much circle. But it can’t be a straight pullback either – what I call a Katniss Everdeen throw because it looks like you’re firing a bow and arrow. A small arm circle will provide the action/reaction needed to get the ball there quickly. Once you understand this, it’s important to have players practice these throws. Which means they may need to consciously work on different types of throws during warmups if they play different positions. For example, a catcher who also plays outfield may want to start with a full motion to loosen up, switch to a catcher throw around 60 feet, then go back to a longer motion if you’re extending it further. The more they understand the different types of throws, the better they’ll be able to execute them in the games – and the better chance you’ll have of getting more outs. Especially on close plays. Do you have your players work on different types of throws by position? If so, has it helped? Anything you wish your players did differently? 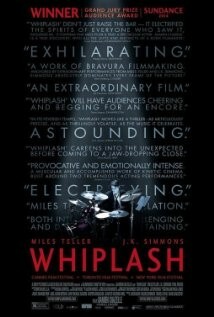 I know this may be hard to believe for anyone who knows me personally, but apparently I was a little behind in my movie watching because I just saw the movie “Whiplash” on cable. Released in 2014, it was the winner of three Academy Awards earlier this year, including one for J.K. Simmons as the brutal band director. And by “stop at nothing” they mean he screams at, berates and humiliates the musicians playing for him without pause, prejudice or mercy. It’s fascinating (although sometimes difficult) to watch, especially Simmons’ performance. Be warned he drops F-bombs the way ET drops Reese’s Pieces – as though he needs them to find his way back to his music stand. So why am I talking about a movie about a jazz band in a fastpitch softball blog? Because Simmon’s character Fletcher is less like a band director and more like many youth sports coaches we see out on the field. I played in bands through high school and never ran across anyone even remotely like him. Understand in the movie his methods work. The fictional Shafer Conservatory #1 jazz band is the top jazz band in the country. Not sure if they’d work in the real world, but that’s kind of the point of this post. For support he points to a story about jazz great Charlie “Bird” Parker having a cymbal thrown at him during a performance by Jo Jones. (According to IMDB’s trivia section that didn’t actually happen. Jones dropped the cymbal, essentially “gonging” Parker off the stage.) Fletcher then says Parker could’ve quit right there, but instead the incident drove him on to become a great. That’s what Fletcher says he is trying to do for his students – even literally throwing a cymbal at Andrew at one point. So here’s the question: is Fletcher right? Is the only way to push someone to achieve greatness to abuse them until they either sink or swim? If it’s not the only way, is it the best way? Or even an acceptable way? Can people achieve greatness through encouragement and supportive behavior rather than abuse, or does it hold them back? Me personally, I don’t believe it requires abuse. Do you need to set high standards? Yes, absolutely. I hate hearing “good job” when something clearly wasn’t. But you don’t have to be abusive to have high standards. That’s just me, though. What do you think? Earlier today I was emailing with my friend and fellow coach Mike Borelli about how players who look great in practice will come out into games all nervous and tentative. It’s actually pretty common. They work hard to learn their skills. They take lessons, they practice, they really put a lot of effort into it. Then they get into a game and they look like the proverbial deer in headlights. Perhaps the best analogy I can come up with, and one that most of us can relate to, is when we start to drive after getting our driver’s licenses. Even though we’ve received hours of instruction, and spent countless more hours driving with our parents (or other qualified adults), none of that matters the first time we’re handed the keys to the family car. We are nervous, we are tentative, we are afraid that we will make a horrible mistake and wrap the car around a tree, or will have trouble parking it and scratch the paint, or do something else that will get us in trouble. So we drive cautiously at first. Eventually, though, we gain experience and confidence as continue to drive, and after a while it becomes second nature. If you’ve had your license for any length of time you probably don’t even think much about where your hands go or where to look on the road. You just get in drive. That’s the same experience players often have after they’ve worked on new skills. No matter what they’ve done off the field, nothing compares to actually being in a game. Until they’ve had a chance to “drive” those skills for a while they’ll be tentative, unsure of what they can do and wanting not to make any mistakes. It’s just a part of the total experience. The best you can do is give them the “keys” and give them the opportunity to get comfortable with their new skills. The more experience they gain the more they’ll relax, which will really put them in the driver’s seat. Ask any fastpitch player, coach or parent what the team’s goal is and the easy answer will be “to win.” But when you look at things a bit deeper winning may not always be the primary goal. Take a 10U or 12U team making the jump from rec ball to travel ball. It can be quite an eye-opener for the girls and the parents. The rules change, the game gets faster, the teams get more aggressive, and the overall caliber of play is generally higher than they’re used to seeing. In that first year wins may be tough to come by. But that’s ok. The real priority should be getting the players acclimated to the level of competition and helping them understand what it’s going to take to perform their best long-term. That may mean sacrificing a few opportunities to win in favor of player development. That could mean letting a hitter who isn’t producing bat, even though a better hitter is available. It may mean suffering through more walks to give a pitcher with good long-term potential the opportunity to get reps in facing batters. It might mean putting a fielder into a position she hasn’t quite learned yet in order to give her the experience to play it later. Winning is nice, no question about it. Me personally, I subscribe to the statement from Moneyball that I hate losing more than I like winning. But if your goal is to develop a team, and its individual players, to be the best they can be, you need to have a plan and stick to it – even if it means you lose more games than you would have otherwise today. It’s all about your goals, which is why it’s important to set them before the season, when you can be unemotional about it, rather than during the season when you may be willing to do anything required just to get the W.
Know where you’re headed long-term and you’ll be in great shape. And when those wins do start coming, they will be all the sweeter. Daylight Saving Time – yes or no? 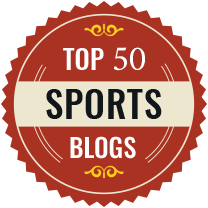 This might seem a bit of an unusual topic for a softball blog but bear with me. Over the past few days (because of the changeover this weekend – hope you changed your clocks) I’ve been hearing a lot of talk in the media about getting rid of Daylight Saving Time (DST). As a longtime softball coach, I would hate to see that happen. Wouldn’t you? Yeah, it’s kind of a pain to lose an hour of sleep in the first weekend of March. But the tradeoff is more softball time at night in the summer. Where I live, for most of the summer it stays light outside until about 9:00. That means plenty of light to start a game at 6:00 and have it go for two hours without lights on the field. Even if it goes a couple of extra innings there’s plenty of extra light. But without DST, by the time late July comes along you’d be pushing it to have enough light to finish a two-hour game. That seems wrong. We have a summer sport. We need the extra daylight. If you’re given the opportunity to take a poll, be sure you say “yes” to DST! So what have you been hearing? Would losing DST affect your season? 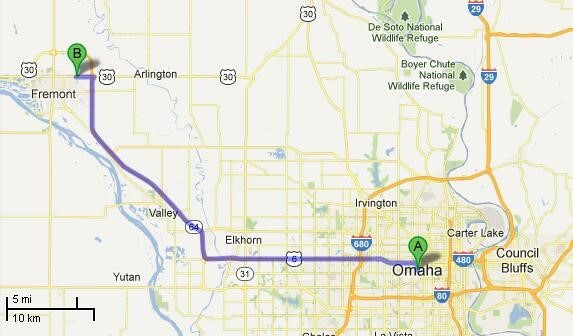 Let’s say you live in Cleveland and you decide you want to drive to Omaha. How are you going to get there? One way to do it is to hop in your car, point it west, start driving and hope for the best. You’ll probably get there sooner or later, but odds are it will take you longer than if you had used one of the other choices. Another option is to pull out a paper Atlas (like we used to in the old days) and map out your route on paper. That will be better than just randomly driving, but for best results you need to be pretty good at reading maps. Not everyone is. If you misinterpret the map, or the roads have changed since your Atlas was printed, you could end up getting lost. (Think Clark Griswold in the first Vacation movie.) If you do lose your way, you may not even realize it for a while, in which case it will probably take a bit of backtracking to get you back on the right road. Then there is using Google Maps (or your mapping application of choice). You can plug in your starting point and destination and the entire route will be laid out for you step-by-step. If you’re using a PC you can print it out and take it with you, without all the extraneous information that is in an Atlas. If you’re using it on your smartphone, a pleasant voice will guide you turn-by-turn to your destination, with easy-to-read visuals along with it. If you happen to make a wrong turn anyway, or the roads have changed, Google Maps will recognize you’re heading in the wrong direction and immediately guide you back to where you need to be. Those are the things a private instructor will do as well. You don’t absolutely need one to get to where you’re going, but like Google Maps an instructor will help you get there faster. A private instructor will lay out a good foundation using techniques, drills and cues that have proven successful before – but adjust to the specific needs of the player. The instructor will offer that same sort of turn-by-turn guidance that helps players stay on the path to success rather than wandering off into dead ends. If something gets “off” due to any of a dozen reasons, the instructor will help guide the player back onto the right path. This isn’t just for beginners, either. Even accomplished players need a little help now and then. Every professional team has position coaches and instructors who are there to help players improve their games and overcome problems. When Tiger Woods was at the top of the golf world, he still had a swing coach who worked with him to help him stay there. In his book The Talent Code, Daniel Coyle lists the three essential elements to achieving excellence. One is motivation, and another practice. But the third is coaching. Not that the coach has any special magic to offer. But because the coach can help make sure that players spend their time practicing the right things in the right way rather than trying to feel their way through the process. Again, it’s not for everyone. If you’re just planning to drive around your own neighborhood you don’t need Google Maps – or at least you shouldn’t. But if your goals are to get out into the larger world, you might want to have a guide by your side. The other night when I got out to my fastpitch softball lessons I had a pleasant surprise waiting for me. My first lesson was with a high school senior pitcher, and her high school coach was there to observe. I couldn’t have been more pleased! All too often it seems the relationship between private coaches and team coaches – either in high school or travel ball – is contentious. I’m not sure why but it’s not uncommon. It’s much smarter for there to be a sense of cooperation. Private coaches work with players on an individual basis far more than a team coach ever will have the time for. They teach specific skills and learn what cues trigger performance and success for those players. If the player (or her parents) have chosen wisely, that player comes onto the team with an advanced skillset built over many hours of practice. At the same time, there will be players who have put little effort into learning their skills. That is where the team coach can make a difference. Focusing their limited time on raising the skill levels of those players will pay the best dividends. Because, of course, the chain will only be as strong as its weakest links. In this particular case, I invited the coach into the cage with us so he could hear the instruction and ask questions if he had any. He brought his iPad in with him and shot video as we went along. I periodically asked if he had any questions, and he had the opportunity to see how I interacted with my student/his player. It was a very pleasant half hour. I left the coach with an open invitation to come back any time. Kudos to the pitcher’s parents for setting it up, incidentally. Of course, it’s easy for me to take this position as a private coach. But I have also experienced it from the other side. While I wasn’t able to attend an actual lesson, when I was a team coach and had pitchers who were not my students, I would contact their pitching coaches to learn what to look out for, what cues they used and what they were teaching those pitchers. It may not have been what I taught, but that’s ok. I wanted to work with what they had learned and what they were supposed to be doing rather than trying to re-make according to what I teach. Presumably, everyone – team coach, private coach, parents and the player – want the same thing. They want the pitcher to be successful. Working together is far more likely to make that happen than constant territorial battles. After experiencing the healthcare system myself not long ago and having my wife take a visit to the ortho yesterday, I had a realization today. When doctors are trying to diagnose a joint injury they will talk to the patient, try a few manipulations and overall eyeball the problem. More often than not, though, they will send the patient for an MRI to see what they can’t observe with the naked eye. The coaching equivalent is video. No matter how much experience a coach has, there’s nothing like being able to slow things down and take an in-depth look at a pitch, a swing, a throw, a fielding play or some other technique. And these days it’s easier than ever. When I first started coaching, shooting and analyzing video meant hooking a handheld video camera on a tripod up to a laptop. If you were planning to shoot video throughout the day or evening, it also mean running an extension cord to a power strip. If you wanted to change angles it could take a few minutes to get everything set up again. Nowadays all you need is a smartphone or tablet and an app, such as Coach’s Eye, RVP or Ubersense. You can shoot the video, run it back and forth in slow motion and even draw lines, measure angles and perform other actions. And with the advances in the devices, you can shoot at high frames per second rates that make everything very clear and easily visible. Over the last few days I’ve used my new iPhone 6 and Coach’s Eye to do some valuable analysis – and show the players what we’re looking to do. They weren’t big mechanical issues, but instead the small details that make the difference between good and great. We were also able to see all the things they’re doing right, which was a feelgood. Like the MRI, it exposes things you may not see otherwise – and share them with the player. Being able to show rather than tell can be incredibly valuable, especially for younger players who may be more visual than audible learners. Showing them what they’re doing often helps them understand what you’re trying to describe as a coach. With modern technology, you can do it instantly – which is what every study of coaching will tell you is most effective. Doctors love their MRIs. Coaches should love their video apps. They can really help shortcut the learning experience for your players.